NIRP is quickly becoming a consensus policy within the economics establishment. This paper argues that consensus is dangerously wrong, resting on flawed theory and flawed policy assessment. Regarding theory, NIRP draws on fallacious pre-Keynesian economic logic that asserts interest rate adjustment can ensure full employment. That fallacious logic has been augmented by ZLB economics which claims times of severe demand shortage may require negative interest rates, which policy must deliver since the market cannot. Regarding policy assessment, NIRP turns a blind eye to the possibility that negative interest rates may reduce AD, cause financial fragility, create a macroeconomics of whiplash owing to contradictions between policy today and tomorrow, promote currency wars that undermine the international economy, and foster a political economy that spawns toxic politics. Worst of all, NIRP maintains and encourages the flawed model of growth, based on debt and asset price inflation, which has already done such harm. In this blog we discussed several times the reasons why exchange rate depreciation is not necessarily a panacea for current account problems (see for example here and here on Argentina depreciation before the last one with the Macri administration, here on the Europe, here in general about the idea of a Sustainable and Stable Competitive Real Exchange Rate or SSCRER, and here on the role of the exit from the Gold Standard during the Depression). Exchange rate skepticism suggested that depreciation often works because it is contractionary, and it worked by causing a recession and reduced imports. The optimists, like the so-called New Developmentalists pointed out to the positive impact on exports. "An obvious reason for the low explanatory power of price competitiveness is that a large part of trade involves intermediates products – i.e. inputs used within rather well established global value chains (GVCs) – and is thus far less influenced by pure exchange rate considerations." "By disentangling the impact of exchange rate changes on trade results, we have shown that the underlying assumption of the ‘currency wars’ discussion – that devaluations bring about substantial export gains – may be severely flawed." The evidence seems to suggest that depreciation does not stimulate the type of substitution that would lead to external equilibrium, neither on the import or export side, and that a devalued currency is no substitute for industrial policy. Of course evidence, once John Eatwell noticed, has not solved any economic debate so far. This Tuesday June 28, 2016, the AFL-CIO is holding a conference titled “Trading Up: A Critical Perspective on Jobs, Governance & Security in U.S. Trade Policy,” from 9:00 am to 5:00 pm in Washington, DC. The full program is here. Participants include Joseph Stiglitz, Dean Baker, Tom Palley, Rob Scott, Jeff Faux, among others. You can join online for what should be an lively and insightful debate—especially given recent developments around the Brexit and the Trans-Pacific Partnership (TPP). You can watch the conference here and join in the discussion online using #BetterTrade. Please tweet any questions for panelists to conference organizer Celeste Drake (@cdrakefairtrade). Among the recent interventions in the capital controversy, the debate between Paola Potestio and Kurz & Salvadori has raised important issues. We agree with Potestio's rejection of the legitimacy of a value endowment of capital but we disagree with her dismissal of the relevance of reswitching and reverse capital deepening: these phenomena are very important because they undermine the demand-side role of the conception of capital as a single factor. For the marginal approach to be plausible, this demand-side role had to imply the stability of the savings-investment market even in shorter time frames than those required by a complete adaptation of the ‘form’ of capital; this was taken by Marshall to authorize doing without a given endowment of value capital, which opened the door to the shift to the modern neo-Walrasian versions of the marginal approach. With proof from Hayek, Hicks, Malinvaud, and Lucas we argue that a continuing belief in traditional time-consuming marginalist disequilibrium adjustments based on capital-labour substitution is the hidden reason why the claim often made by contemporary marginalist economists, that the economy can be assumed to be all the time on the equilibrium-growth path, is not found patently unacceptable. The true microfoundation of DSGE macromodels is not intertemporal equilibrium theory, but the time-consuming adjustment mechanisms on whose basis the marginal approach was born and accepted, and on whose basis monetarism was then able to re-assert a pre-Keynesian view of the working of the economy. You can read the preliminary version at the Siena working paper series here. The idea that the capital debates is a central issue in macroeconomics has been discussed recurrently in this blog. There will be a lot of postmortems for the European Union (EU) after Brexit. 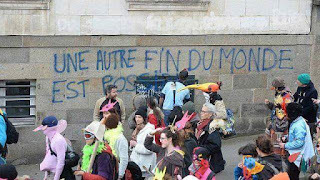 Many will suggest that this was a victory against the neoliberal policies of the European Union. See, for example, the first three paragraphs of Paul Mason's column here. And it is true, large contingents of working class people, that have suffered with 'free-market' economics, voted for leaving the union. The union, rightly or wrongly, has been seen as undemocratic and responsible for the economics woes of Europe. 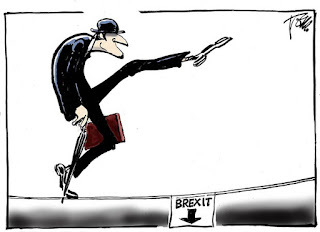 The problem is that while it is true that the EU leaders have been part of the problem and have pursued the neoliberal policies within the framework of the union, sometimes with treaties like the Fiscal Compact, it is far from clear that Brexit and the possible demise of the union, if the fever spreads to France, Germany and other countries with their populations demanding their own referenda, will lead to the abandonment of neoliberal policies. Austerity will most likely continue. On this matter, note that the United Kingdom did not ratify the Fiscal Compact, and austerity is a completely home made policy, consolidated by the current Conservative government, but also by the previous Blairite New Labor. And Socialist governments in France (you can say the same of Syriza in Greece) have also accepted austerity as the only alternative. Most of the austerity policies imposed on the peripheral countries are actually the result of the euro, and are to a great extent independent of the existence of a broader political union. Of course the mechanisms for imposing austerity pass through the institutions of the union, but it is clear that progressive policies can be pursued within the union. In order to understand the limitations of the European project it is important to remember that the original project, associated to the Treaty of Rome built on the European Coal and Steel community, was a policy that aimed at resolving the perennial Franco-German conflict, with the cooperation of the US, in the context of the Cold War. The project went hand in hand with Keynesian policies at home, and the development of the modern Welfare State, possible in part as a result of the Marshall Plan. On the other hand, the modern union is often confused and seen as being inextricably associated with the euro, which was designed after the Conservative resurgence in the 1980s, and consolidated in the 1990s after the collapse of the Soviet block. That is, the euro was created in the neoliberal Thatcherite world in which supposedly 'there is no alternative.' The context has not changed much, even if there is a revolt against neoliberal policies. And that is why separating the euro project (the case of Grexit would be based on that) from Brexit is important. This is hardly the demise of neoliberal policies. Even the end of the European Union would not guarantee that pro-worker coalitions would win elections, or that if elected they would purse Keynesian expansionary policies (btw, it is also unclear that Grexit would solve all the problems in Greece, and that a default would be successful, although I do think the case is stronger there). Globally, in fact, there is no evidence that neoliberalism is retreating. In Latin America, the opposite seems to be the case. In the US the same working class anger with neoliberal policies, austerity and stagnation has led to both Bernie Sanders and Donald Trump's insurgent campaigns, but we may end up with the same old neoliberal policies as always (yeah, I mean Hillary Clinton; and no Bernie and Donald are not the same, but that's another issue, and I would vote for Hillary). Even worse, some elements of the revolt of the masses in the US have led to a wave of anti-immigrant sentiment and outright xenophobia, not unlike the UK. And that is something that Nigel Farage and Boris Johnson have exploited in the UK. And remember that Jeremy Corbyn was for Remain, and that he may also suffer with Brexit, and with that the insurgence against neoliberal Blairism within Labor. Personally, I cannot see that the disintegration of Europe would lead to a positive outcome. Sure the EU has a significant democratic deficit, and a bureaucracy that is seen as wasteful and inefficient (that is always, btw, part of the right wing propaganda for smaller government; you know, because private corporations are always so efficient and democratic, aren't they?). The same is true of American democracy. Ask the Bernie supporters re-counting votes in California (or Al Gore for that matter). So maybe secession should be the solution (yeah, in the US it's the right wing crazy lunatic fringe in Texas that thinks that this is a good idea). And yes, the right wingers in Europe are rejoicing (Trump too). At a minimum the European Union provided an environment in which people could move freely, in which petty nationalism gave way to acceptance of foreigners and immigrants, something particularly relevant with the refugee crisis in the neighboring region. Some may suggest that this was very little to show for. And the alternative, does it have something to show for? If the European Union really collapses, there will be very little for progressives to be happy about. 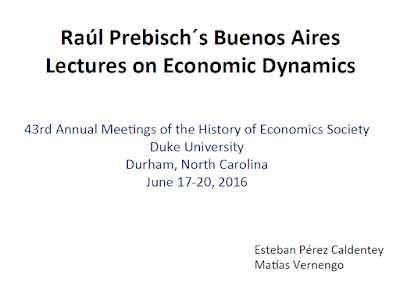 Here is the link to the power point presentation on the unpublished Buenos Aires lectures given by Raúl Prebsich on economic dynamics at the University of Buenos Aires in 1948, right before he entered ECLAC, that we presented (actually Esteban did it, I only participated in the Q&A) at the History of Economics Society Meetings. Next year the conference is in Toronto. 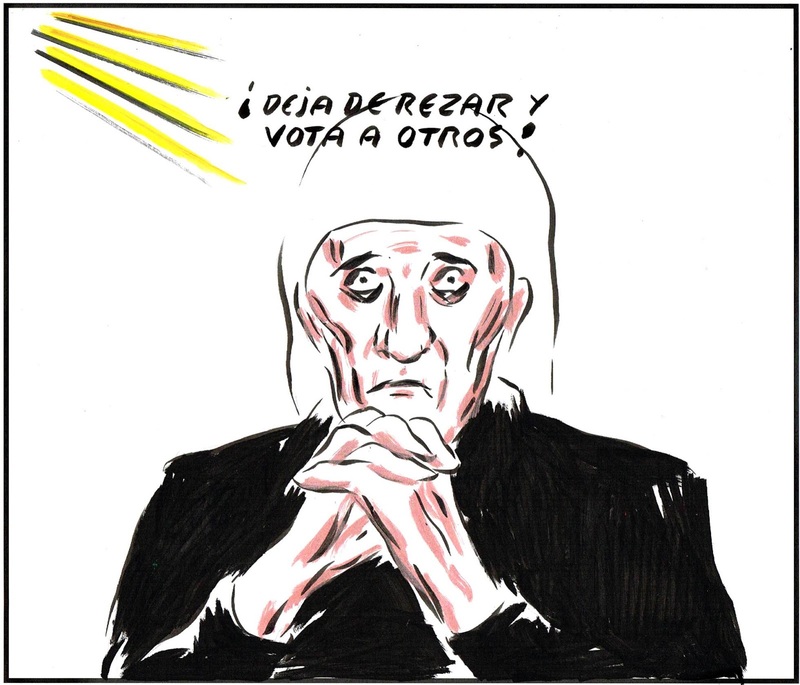 Stop praying and change your vote! The management of the economic crisis has had devastating consequences for our country, as well as for the eurozone as a whole. The fiscal austerity and wage reduction policies imposed over the last few years have unnecessarily prolonged the recession across the continent and generated deep social fractures by increasing economic and social inequalities. Fiscal austerity and wage reduction policies have led us to a lost decade. Across the Eurozone, we haven’t yet regained pre-crisis level of per capita income, and in Spain this indicator is still 5% below its 2007 level. In our country, only one in three jobs lost during the crisis has been recovered, job precariousness has aggravated, and 29% of the population lives at risk of poverty or social exclusion. Read full manifesto against austerity here. I'm number 50 of more than 177 signatories. I've been posting less frequently with the end of the school year. 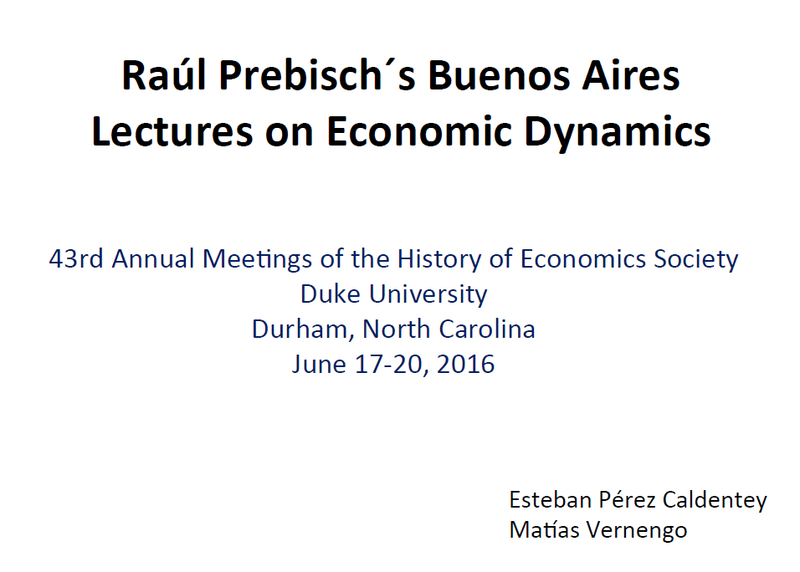 Will be going to the History of Economic Society Meeting this weekend. Posting will be even more limited. At any rate, hope to be able to say something more substantial on Brexit before the referendum. Let me say that I'm against Brexit, which is I suspect the view that Wynne Godley would take on the issue. He was firmly for Europe, but against the euro as it was shaped, but not in all circumstances. He correctly pointed out that a common currency requires a fiscal union. It seems that more than a few heterodox Keynesians (post-Keynesians for the most part) have come in favor of Brexit. I think it is important to emphasize the difference between the common currency (the euro) and leaving it, for example, Grexit, and the European Union. Brexit, of course, refers to the last, since the UK has its own currency, the pound. Mind you, I don't think that the problems with leaving the EU are essentially economic, and I think to emphasize these costs is a mistake. The real problem with Brexit is the political costs, associated to a more closed view of what Europe means. It would lend support to radical right wing views that reject a more culturally and ethnically diverse Europe, and it might, as Yanis Varoufakis suggested lead to the slow disintegration of the European project. I have posted a few videos of 'Yes, Minister' before. The one below (h/t Ramanan) is apropos. Enjoy! Terry Jones documentary Boom Bust Boom has been out for a while. Worth watching too. The Economist gave it a reasonable review. And there are Minsky and Galbraith puppets. Above a brief, and simple discussion of the South Sea Bubble. I think role of trade with Spanish America is exaggerated. The most relevant part of the scheme was the public debt swap. Dale's The First Crash provides an interesting account of it. Documentary on the Reuther brothers and the role of unions in the prosperity of the Golden Age of Capitalism. Worth watching. John Oliver's story on debt collection is very instructive. It looks only at the domestic practices, but these are essentially the same as the ones used by Vulture Funds in international financial markets. So respectable businessmen like Paul Singer, a top GPO contributor that owns the Elliot Vulture Fund that buys debt of developing countries and sues them in New York courts, or the international organizations like the IMF that impose conditionality on poor indebted countries are not much different from the bottom feeders described by Oliver. After the breakdown of the Bretton Woods regime and the subsequent deregulation in capital flows around the globe, the movement of financial assets and liabilities has increased several times faster than trade and GDP growth. While still mainly concentrated between advanced countries, financial flows to emerging and developing economies (EDEs) have been rising at an exponential rate, particularly in the last two decades. However, public external debt (as per cent of GDP) has been on a downward trend in the 2000s (though the trend has been slightly reversed since the 2008 crisis), with a larger proportion being denominated in domestic currency, but attracting more non-resident private investors (Arslanalp and Tsuda 2014). The other big story of the last fifteen years, notwithstanding, is quite different: private external debt has been on a marked rise. As Akyüz (2014) reviews, the share of private debt denominated in a foreign currency has increased sharply, and that is not the only concerning feature observed in the data. Avdjiev et al (2014) notice the importance of private non-bank lenders in in the external financing of many emerging countries, and the role of overseas affiliates of EDEs corporations established in off-shore financial centers, rendering its recording more difficult. And though cross-border bank lending still represents the larger share of total external borrowing, there has been a fast increase in the issuance of debt securities by the private non-banking sector of EDEs and its off-shore affiliates (Butzen et al 2014), a more volatile kind of flow, together with portfolios investment. Far too numerous crises in emerging (and some advanced) economies have been preceded by explosions in private foreign borrowing, starting from the 1970s in Latin America, and continuing during the 1990s also in Latin America and (above all) South-East Asia, as told by Palma (2001). And in the last decade we have seen the burst of the Eurozone, also triggered by sharp increases in foreign indebtedness (Storm and Naastepad 2016). Financial fragility is not the sole cause of these crises and the lasting damage they leave behind. As I mention in my recent book (Bortz 2016), private foreign borrowing turn the odds of wage bargaining against labor, lowering the wage share and putting aggregate demand in a more fragile standing. Motives for this result abound: the impact of higher indebtedness and debt servicing on firms’ balance sheet (costs that firms try to pass on consumers); the fact that mounting foreign borrowing and capital inflows are matched by financial deregulation that stimulates alternative outlays other than capacity-building investment; and because they are tied to the rise of sectors such as the FIRE sector (financial, insurance and real state) lowering aggregate productivity, among other reasons. Jayadev (2005), Stockhammer (2009) and Furceri and Loungani (2015) all find empirical support for these hypothesis. After amending in 1997 its Articles of Agreement, requiring member countries to liberalize their capital account, the IMF has joined the large chorus of voices calling for capital controls, although in the most muted way possible (IMF 2012, p. 2). Calls for restoring capital controls rise across the economic spectrum, from authors with a more orthodox point of view such as Hélène Rey (2013) to non-mainstream economists such as Vernengo and Rochon (2000), Epstein (2005), Bibow (2011), Gallagher (2014), Grabel (2015), among many others. International institutions such as UNCTAD have been at the frontier of the debate (UNCTAD 2001, 2014), and even recent research by IMF staff has dwelled into the topic (Ostry et al 2011, Canuto and Ghosh 2013). It is within this context that I suggest a novel proposal for consideration, the implementation of which should obviously reflect the particularities of each economy. What I propose is a refundable tax on foreign private borrowing, that discourages speculative borrowing in favor of productive investment. The basic idea is simple: companies should pay a tax when they borrow abroad, either through banks, issuing debt securities, when they borrow from their home companies or off-shore affiliates. That tax would be reimbursed if firms can prove that these credits have been used to fund productive investment. This proposal is particularly fit to counter lending and borrowing between affiliates, a common channel to facilitate transfers of funds in times of need with disregard of the economic conditions of the country. For instance, it was one of the major channels by which affiliates in EDEs transferred large amounts of foreign currency to their home companies in developed countries during the 2008 financial crisis and the Eurozone crisis. Implementation aspects raise a couple of questions of which I am fully aware. First, there is the need to define precisely what “productive investment” stands for: does it include software licenses and patents? Second, the State would require the administrative capabilities to verify the companies’ claims on the nature of their borrowing, while assuring that banking funds are indeed available in the domestic market (perhaps through public banks and/or development banks). However, the main intention of this proposal is to pass the burden of the proof to firms rather than the State. A further issue to be discussed concerns cross-border bank lending. The scheme should discriminate in favor of foreign lending for investment purposes, though its implementation would involved more thoughts and efforts in its design. This proposal should not be thought of as a substitute for more specifically-FDI-oriented policies. There may well be different and valid reasons for countries to discourage FDI, and this measure does not stand in its way. It is not incompatible with other typical capital control measures such as unremunerated reserve deposits on financial investments or measures that restrict capital flights. This proposal is just one instrument, perhaps a modest one, to try to curb speculative borrowing by firms, particularly in foreign currency, an ever-increasing practice which offers negligible benefits and which adds to headwinds when foreign reserves are needed the most (Chui et al 2014). 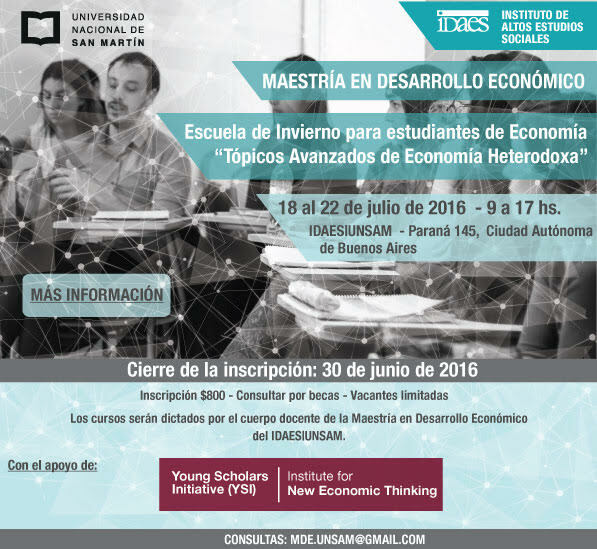 *Pablo G. Bortz is currently Professor at the National University of San Martin. He is the author of Inequality, Growth and ‘Hot’ Money, published by Edward Elgar. With the usual caveats, the author thanks Edgardo Torija Zane for our fruitful discussions on this proposal. Akyüz, Y. (2014): Internationalization of finance and changing vulnerabilities in emerging and developing economies, Discussion Paper No. 217, United Nations Conference on Trade and Development, Geneva. Arslanalp, S. and Tsuda, T. (2014): Tracking global demand for emerging market sovereign debt, Working Paper No. 14/39, International Monetary Fund, Washington, DC. Avdjiev, S., Chui, M. and Shin, H.S. (2014): Non-financial corporations from emerging market economies and capital flows, BIS Quarterly Review 2014, December, pp. 67–77. Bibow, J. (2011): Permanent and selective capital account management regimes as an alternative to self-insurance strategies in emerging-market economies, Working Paper No. 683, Levy Economics Institute of Bard College, Annandale-on-Hudson. 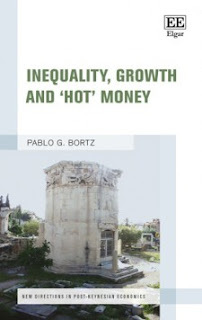 Bortz, P. (2016): Inequality, Growth and ‘Hot’ Money, Edward Elgar, Cheltenham. Butzen, P., Deroose, M. and Ide, S. (2014): Global imbalances and gross capital flows, National Bank of Belgium Economic Review 2014, September, pp. 41–60. Canuto, O. and Ghosh, S. (eds) (2013): Dealing with the Challenges of Macro Financial Linkages in Emerging Markets, World Bank, Washington, DC. Chui, M., Fender, I. and Sushko, V. (2014): Risks related to EME corporate balance sheets: the role of leverage and currency mismatch, BIS Quarterly Review 2014, September, pp. 35–47. Epstein, G. (ed) (2005): Capital Flight and Capital Controls in Developing Countries, Edward Elgar, Cheltenham UK. Furcer, D. and Loungani, P. (2015): Capital account liberalization and inequality, Working Paper No. 15/243, International Monetary Fund, Washington, DC. Gallagher, K. (2014): Ruling Capital: Emerging Markets and the Re- regulation of Cross-Border Finance, Cornell University Press, Ithaca, NY. Grabel, I. (2015): The rebranding of capital controls in an era of productive incoherence, Review of International Political Economy, Vol. 22 (1), pp. 7-43.
International Monetary Fund (2012): The liberalization and management of capital flows: an institutional view, International Monetary Fund, Washington, DC. Jayadev, A. (2005): Financial liberalization and its distributional conse- quences: an empirical exploration, Ph.D. dissertation, University of Massachusetts Amherst. Ostry, J.D., Ghosh, A.R., Habermeier, K., Laeven, L., Chamon, M., Qureshi, M.S. and Kokenine, A. (2011): Managing capital flows: what tools to use?, Staff Discussion Note No. 11/06, International Monetary Fund, Washington, DC. Palma, J.G. (2001): Three-and-a-half cycles of ‘mania, panic, and (asymmetric) crash’: East Asia and Latin America compared, in H.J. Chang, J.G. Palma and D.G. Whittaker (eds): Financial Liberalization and the Asian Crisis, Palgrave, Basingstoke. Rey, H. (2013): Dilemma not trilemma: the global financial cycle and monetary policy independence, Proceedings of the Economic Symposium of the Federal Reserve Bank of Kansas City, Jackson Hole, WY. Stockhammer, E. (2009): Determinants of functional income distribution in OECD countries, IMK Studies No. 05/2009, Hans Böckler Stiftung, Düsseldorf. Storm, S.T.H. and Naastepad, C.W.M. (2016): Myths, mix-ups and mishandlings: understanding the Eurozone crisis, International Journal of Political Economy, Vol. 45 (1), pp. 46-71. UNCTAD (2001): Trade and Development Report, UNCTAD, Geneva. UNCTAD (2014): Trade and Development Report, UNCTAD, Geneva. Vernengo, M. and Rochon, L.P. (2000): Exchange rate regimes and capital controls, Challenge, Vol 43 (6), pp. 76-92. Announcement for those interested in a Summer (Winter down there) school in Spanish. Argeo Quiñones-Pérez and Ian Seda-Irizarry discuss the crisis in this piece. They correctly point out the neocolonialist solution being imposed by the US administration. I find the imposition of a Fiscal Control Board (FCB) particularly problematic. Back when Argentina defaulted in 2002, Rudi Dornbusch had suggested something similar. At that time I sent the letter below to the Financial Times that had published his proposal. Sir, Back in February 1997, Professor Rudiger Dornbusch said: "Argentina is on the go - (it) is the only country in the world today that enjoys both price stability and vigorous growth." The reasons were associated, according to Prof Dornbusch, with hard money and pro-market reforms. Argentina's policies then were an example to Brazil, Mexico and other developing countries. Now, Prof Dornbusch together with Prof Ricardo Caballero tells us that this exemplary economy was not so ("Argentina cannot be trusted", March 8). Prof Dornbusch should clarify what transformed this successful liberalisation experience into a catastrophe, or explain why he changed his mind. Also, it must be noted that suggesting a foreign board of central bankers to control monetary policy, and another foreign board to verify fiscal performance, is tantamount to suggesting colonisation of Argentina by foreign agents. The question then is whether Argentina should be returned to Spain. Or does Prof Dornbusch have another suggestion? Note that the problems, both of Puerto Rico and Argentina, are related to debt in foreign currency, and, hence, to balance of payments issues, rather than fiscal per se. In addition, note that Argentina was quasi-dollarized by Convertibility, while Puerto Rico is effectively dollarized. Btw, the new government in Argentina wants to be re-colonized by Spain (the finance minister apologized to Spanish investors recently; see here). The hope of some on the left, in Puerto Rico, was that, with a Bernie victory in the primaries there, the movement for decolonization could gain some force. Alas, Hillary won the primary. A more detailed discussion of the crisis by the same authors is available here in their paper "Wealth Extraction, Governmental Servitude, and Social Disintegration in Colonial Puerto Rico." Or so it seems. The BLS last employment situation summary says that only 38000 jobs were created last month. 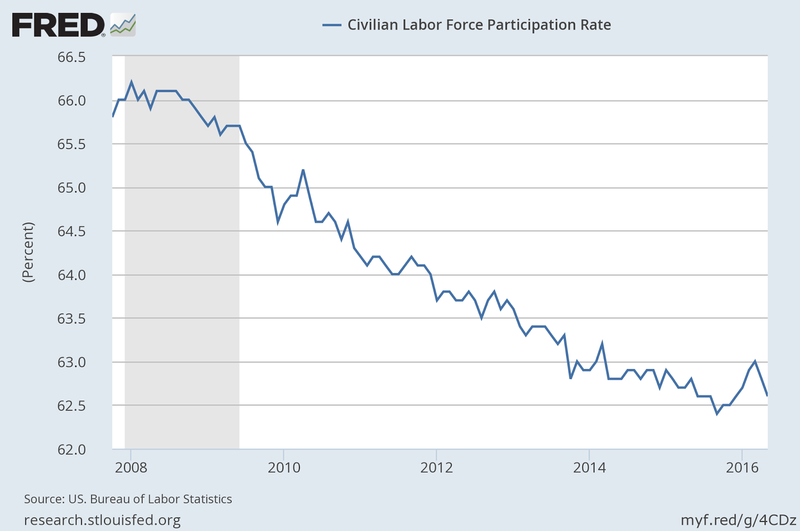 Unemployment fell to 4.7%, but that is mostly the result of the fall in the participation rate, that is, less people in the labor force (see below). In other words, unemployment rate is lower not because unemployment decreased (at least not much), but because workers stopped looking for jobs. 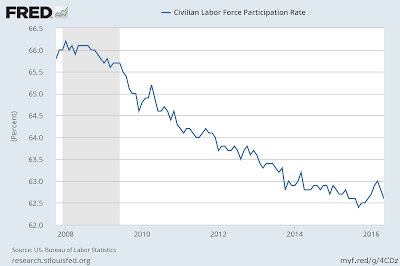 Since the crisis there has been no recovery in the labor force participation rate, as shown in the figure above. This report is consistent with the slow rate of GDP growth announced last week. The economy is slowing to a halt. The Fed should not hike the rate later this summer, but that's not enough. The US needs less austerity. Urgently. Overdose of heterodoxy, failed Keynesian policies or same old balance of payments constraint? Governments often struggle to balance their books, leading to over-indebtedness and financial trouble. Yet fiscal prudence is one of the most frequently attacked principles of economic orthodoxy. But Venezuela shows what happens when prudence is frowned upon and fiscal information is treated as a state secret... Venezuela used the 2004-2013 oil boom to quintuple its external public debt, instead of saving up for a rainy day. By 2013, Venezuela’s extravagant borrowing led international capital markets to shut it out, leading the authorities to print money. So fiscal problems, too much spending and borrowing, too much money printing, which caused inflation and the currency crisis (the black market gap between the official and parallel value of the domestic currency). As I have discussed in many posts (too many to link) and in a recent paper causality is upside down. It is the external problem, the current account deficit (as I noted in the previous post) that is at the heart of the problem. Actually, as far as I know the authorities remained for a long while very anti-Keynesian and not particularly in favor of spending. In the immediate aftermath of the global crisis in 2008-9 Venezuela did not pursue Keynesian anti-cyclical policies vigorously. If memory doesn't fail me Mark Weisbrot actually organized a symposium in which government officials encountered a few heterodox economists to try to convince them of the need of counter-cyclical policies. Mind you, many on the left also assume that the problem is the failure of Keynesian policies, like Michael Roberts suggests in a recent post. 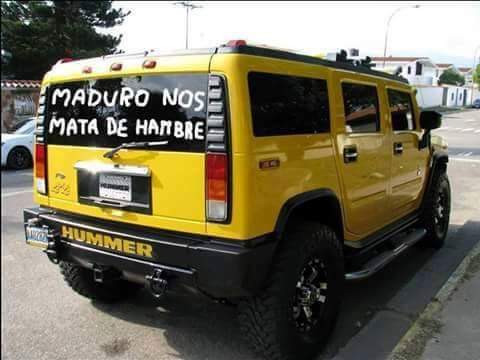 Again, the problems of Venezuela are perennial, and have to do with the excessive dependence on oil, and the need to diversify production, including probably having a preoccupation with food security, and diversifying exports. Hausmann should know, since he has been writing about the importance of what a country exports, or maybe he thinks that orthodoxy (laissez faire, in this context) would magically produce a more diversified export structure. History is not on his side on this. * If you have any doubts see what happened in Argentina after Macri's election. That would be a guide (perhaps a moderate one) to what to expect if a Brazilian like parliamentary coup occurred in Venezuela.